Converse started with a basketball-inspired bang back in 1907. The shoes changed the game of basketball and quickly reached icon status. The All Star was released ten years later. It was a high-performance basketball that set Converse on the map. By 1923, they were on the feet of children and rebels--not just athletes. They've sold in over 100 countries by now. Jack Purcells followed, named after a tennis champion. Today, Converse sneakers can be found on kids, teens, adults, and athletes. A lot of us turn to retro Converse All-Stars for a hint of nostalgia. Chuck Taylors aka Chucks - Classics, Specialty, and Varvatos: These are the shoes that come to mind when you hear the name "Converse." Chucks come in all colors. Some are high-tops made to have the tops flipped down to reveal a complementary color. Some have cartoon character collages. You can even customize your own. Make them unique by lacing them up in an untraditional way. Converse All-Stars also come in high top or low top styles with obvious white stitching to set them apart from the crowd. Basketball - Performance and Classics: The sport that spawned the shoe. Or maybe the shoe that spawned the sport, depending on how you want to look at it. These look more like a modern-day sports shoe than the traditional Chucks. They're leather, offer ankle support, and are very simple in style. Often they have a single star on the side. Lifestyle - Re-issue, Sports lifestyle, and One Star: These look like a cross between the ever-popular Chucks and the basketball shoes Converse has to offer. Still lightweight and simple, lifestyle shoes often sport the same star as the basketball shoes. Another trademark look they've retained? Two, actually: lots of rubber and big, fat laces. If you're on a tight budget, Target sells Xhilaration brand shoes that look very similar to low-top Converse All-Stars. They're available on the website in black and brown for about $10. You can find trendier colors on that site. To make comparison easy, Zappos Shoes sells the real deal. The prices aren't that different. Converse All-Stars don't usually cost more than $35-60. Converse are Comfortable Shoes. They're also all-American, lightweight and come in trendy colors like pale pink and cornflower blue. Another special quality is their ability to transcend cultures; they appeal to punks, rebels, athletes, and kids. Chucks have stuck to their roots among the throngs of air-soled, gel-filled, loud, and heavy athletic shoes. 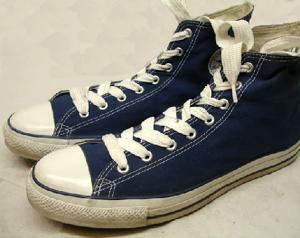 And while other prices have risen, Converse is still a relatively inexpensive brand. They used to sell for about $10 per pair but now they're only up to around $35. The toe guard--you know, the big piece of rubber at the end of the shoe, right above your toe. It looks trendy and at the same time, it's protecting your feet! They're fun and easy to lace up. You can do it in a variety of ways, with all colors of fat shoelaces. Although they feel pretty comfortable and have a relatively simple design, these shoes are not made for athletic wear. Shock-absorption and/or support are not included in the soles of the shoes. Even the hi-tops do not help much with ankle support. If you need more information on the support and/or shock absorption, please look to your doctor, pediatrist, or pedorthist. Buying Converse shoes is quite simple. Make sure one's just like the other, from the way the toe guard sits on the shoe to the distance between the eyelets. Check to see if the tongue pokes out about an inch over your laced-up shoelaces on each shoe. Basically, everything on one Converse shoe should be symmetrical down to the heel patches directly in the back center of the shoe, and its partner should be a mirror-image. Wear quality socks that allow your feet to breathe. Keep your laces untwisted within the eyelet space so they'll last longer and look fresher. Make Converse your own by choosing laces in a different color or size. Center the tongue of the shoe so they'll be more comfortable on your feet. Make sure to confirm that wearing Converse will not create or magnify any foot problems. Bunyons, pronation, supination will all lead to more serious problems and later it will be harder to find shoes that fit and feel comfortable. When caring for your Converse shoes, just say no to bleach! Use soap and water to clean shoes without damage. You can put your Converse shoes in the washing machine, but beware of fading colors. Don't put them in the dryer, however. Leave them out to air-dry.